Officers scrambled as klaxons blared. Chief Engineer Sheldon wished that Nichols was still here – she practically lived for stressful situations like this. What was the joke making the rounds back then – “Nichols isn’t truly happy unless the alert’s as red as her shirt?” But she was long dead and the miracle worker job was his. He just hoped his tenure in the position wouldn’t be measured in minutes. “Assess, plan, engage!” That was his Tellarite instructor’s mantra back at the Academy, and he’d tried to make it his own as well. The assessment of the situation came easy – there was an asteroid the size of a small moon hurtling through space on a collision course with the station. Naturally, this was unacceptable, and so next came the planning. Plan A was to get the centuries-old station thrusters online and use them to move the massive facility out of the asteroid’s path. Normally, the crew would turn the station’s weapons on the asteroid and fire until it was a memory, but the station was defenseless; apparently something called a Ferengi had stolen all of the phaser banks and photon torpedo launchers a while back, while the crew was still in stasis. Since Plan A wasn’t a sure thing, there was Plan B. And there, as the saying went, was the rub. Plan B involved the station’s last functional shuttlecraft – the Earhart. She was filled with Klingons and a hastily-assembled collection of things that blow up in a spectacular fashion. Being Klingons, “things that blow up” included the shuttle itself. The idea being that if the thrusters failed to do the job, the Klingons would push the button and head off to Sto-vo-kor – after blowing the asteroid onto a trajectory that would let it streak past the station without contact. They were out there right now, sitting on that huge chunk of rock, waiting to find honor and glory in case Plan A was a bust. Sheldon had no love for Klingons. His sister was lost in a clash with them in 2267, before the Organians got involved and brought an end to the war. Three years later, a bunch of them got into a brawl on K-13 and wound up in the brig. Three days after that, the station got knocked across time and space. Goodbye, Beta Quadrant, 2270… hello, Alpha Quadrant- circa 1570. And, thus, he put his people to work on Plan A with a vengeance. He’d told Commander O’Ryan he could get the station’s thrusters back online, but even if he were to succeed, there was barely enough fuel to move the station out of the asteroid’s path. There’d be little room for error. Sheldon cursed under his breath. He had not been out of stasis for an entire day before the Commander took him aside and gave him a field promotion to Chief Engineer. Getting used to the new responsibility was mixed in with a lot of meetings with Starfleet counselors and advisors. There was a lot to learn – it was now 2410, and the Federation, Klingons, and Romulans were now part of a galactic alliance. Their Klingon prisoners were now free men, and had been assigned to crew the station alongside their former jailors. To make matters worse, the planet the station orbited - Draconis III - had been scoured of every living thing by some aliens called the Tzenkethi. Supplies, therefore, were few and far between. It was a lot to take in, to say the least. “Sir, thruster three is not powering up!” Sheldon shook his head to return to the task at hand. Crewman Reeve was panicking again, and she had a tendency to get loud when she panicked. Assess, plan, engage. He went into troubleshooting mode and called out to Reeve from his station. “Yes, sir. I also slapped the side of the console and jiggled the cord a little for good measure.” Sheldon swore he could hear Reeve rolling her eyes and smiled. At least the mousy engineer hadn’t lost her sense of humor after being frozen for hundreds of years. He looked up from his console to see how she was doing. It was clear the panic in her was slowly subsiding. Best to keep her on-task, he mused silently. Panic can be very contagious. Alright, it’s go time. Sheldon pushed the intercom button as he initiated the last chain of directives to the computer. Do or die. As Sheldon typed in the command to engage, the rest of the Engineering team crossed their fingers, hoping the thrusters didn’t explode or tear the station apart. The station began to shake as it slowly moved. The computer began to count off the distance-to-safety over the loudspeaker. Meter by precious meter, the station moved out of danger. The computer voice began to say “All clear,” but the cheers of the team drowned the droning, artificial voice. They were safe. Sheldon closed his eyes for a moment to let the achievement sink in before he returned to his remaining task. He ignored Reeve as she ran over to congratulate him, focusing on his console and a series of override commands. Reeve set her jaw and took a step closer to Sheldon. “Sir, respectfully speaking, I’m gonna clobber you if you don’t get away from that station. Unless you want your nose broken again, you better move. ” The older officer smiled. She earned her Starfleet red by doing a tour in Security before transferring to his engineering crew. On any other day, he’d be worried… but not today. “Fools!” Sheldon cried in desperation. “The Klingons are our enemies! They can never be our friends! They never will be!” With that he began to lunge for his console. “Fire,” said Reeve in response. The last thing Sheldon heard was the sound of a phaser discharging. O’Ryan muted the transmission and turned to the other officers in the room – newly-promoted Lieutenant Reeve and Commander Krom of the Klingon Defense Force. “We think he’s suffering from a stasis-induced dementia of some kind,” O’Ryan said softly. “Starfleet’s sending someone out on a ship to help if they can.” Reeve nodded silently in response, while the Klingon smirked and ran his fingers through his beard. “Ha! Well said, Lieutenant! Qavan!” With that, Krom made his way out of the briefing room. The Starfleet officers exchanged a grin as he left. Stay Connected! 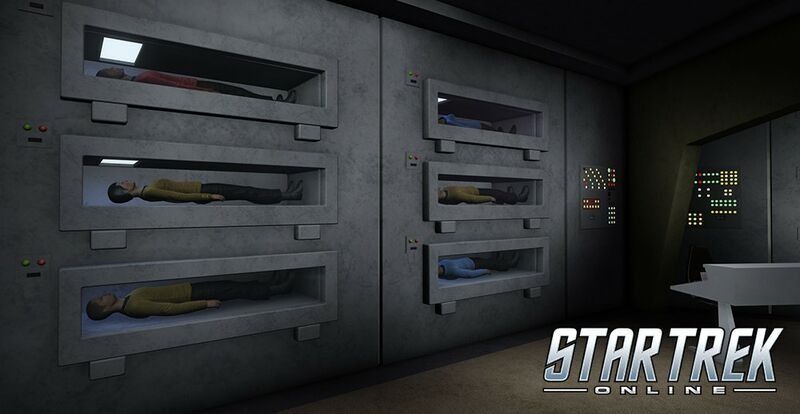 Follow us on our Official Channels to get the latest Star Trek Online news!